Bay of Plenty Regional Council (BOPRC) has developed new and tougher nitrogen rules for the Lake Rotorua catchment. Information on the rules can also be found on the Rotorua Lakes website. If you own land in the Lake Rotorua catchment, we strongly encourage you to check out the rule information and GET INVOLVED! The following table provides an overview of the Proposed Nutrient Rules. This is a summary only – see the full version here. At the RDD meeting on 5 August, 2017 Councillors unanimously voted to accept a report and recommendations from the Independent Hearing Panel relating to Plan Change 10. Submitters had 30 working days following the receipt of the notification of the decision, to lodge appeals with the Environment Court. These appeals have now been published by BOPRC. You can view the appeals here. The NDA is at the heart of the new rules. The basic idea is that the sum of ALL the NDAs across all current pastoral land will reduce nitrogen inputs to the lake by 140 tonnes by 2032. While this is about a 27% reduction overall, BOPRC is looking at different ways of allocating NDAs i.e. some farmers will have to reduce by much more than 27%, some much less, depending on the benchmarked N loss and farm type (Dairy or Drystock). Scientists from NIWA and the University of Waikato have calculated that the sustainable load of nitrogen to the lake is 435 tonnes per year. This is 320 tonnes more than the 755 tonnes coming from all current land uses combined, although some of that nitrogen is moving slowly through groundwater on its way to the lake. The target for reducing nitrogen from better sewage treatment and absorbing nitrogen from the geothermal Tikitere springs is 50 tonnes. This means a 270 tonnes reduction is needed from rural land. Other nitrogen sources (rain, native bush and plantation forestry) cannot be reduced any further. 30 tonnes from replacing gorse with trees. 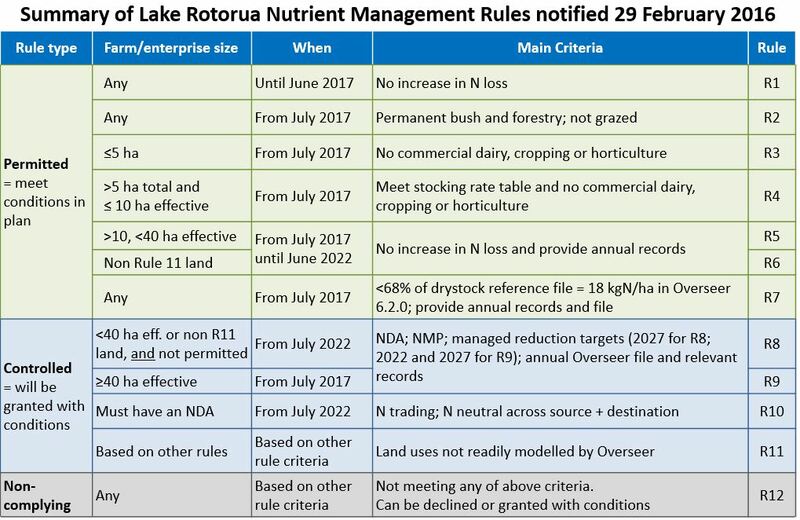 The process for developing new rules” trigclass=”maggie” rel=”fiction”] The nitrogen rules have been developed by BOPRC staff working with the Lake Rotorua Catchment Stakeholder Advisory Group, or StAG for short. The Collective was instrumental in getting StAG established as a collaborative means of influencing new policies and rules. It’s not perfect but better than the traditional way most Councils have developed RMA policy. StAG was the forum where the Collective negotiated splitting the 270 tonne reduction into three parts. You can see all the monthly StAG meeting agendas and minutes here. Download or view the report here. Take a look at the feedback given by landowners at the two public consultation meetings held by the Collective in September 2014. A meeting was held in Ngongotaha on 11 December 2014 to discuss the Lake Rotorua groundwater catchment boundary and how it relates to draft nitrogen rules being developed by Bay of Plenty Regional Council. We heard from two of the scientists involved in defining the boundary – Paul White and Kit Rutherford. There were plenty of questions from the audience which are summarised here. Extended Consultation on Draft Rules - Feedback summary - November 2015. As part of the Bay of Plenty Regional Council (BOPRC) developing the draft rules for managing nitrogen in the Lake Rotorua catchment an additional period of consultation was out between August and October 2015. The majority of the feedback received came from drystock or deer farmers. In addition, there were a number of dairy farms and horse owners who provided feedback. Over half of the feedback came from lifestyle properties.